Here’s what I wore to Rappler’s round table discussion entitled “Labels As Bullies”. I, along with three other women who are all accomplished in their respective fields, was invited by the reputable social news organization to talk about how bullies use labels to bring us down and how we were able to overcome them. As stated on Rappler’s website, “More often than not, women encounter this kind of negativity and are labeled with words that don’t encourage us to succeed. Even worse, the more accomplished we seem to get, the more others try to bring us down.” No matter what industry we’re in, we’ve all experienced bullying. One way or another, we’ve all been there and it’s a topic everyone can relate to. This is why I had no qualms or apprehensions when Rappler approached me to be one of the panelists. Who knows, maybe my simple story can change someone’s life. If you weren’t able to catch the livestream and want to watch the episode, , visit this link. Hopefully, you’ll get inspired by our discussion. P.S. Feel free to share your story as well on the comments section below. I’d love to know how you overcame your bullies and labels. Let’s inspire each other! you look so young. :) BTW, I watched rappler’s discussion about bullying and I didn’t know that you were bullied din po. :( I think bullies wants some attention that’s why they are bullying some people. I made an ask.fm account last year, and of course, the opportunities for haters to hate are there because my account is open to anonymous people. I already forgot what they’re telling me tho, but mostly it’s about my blog. I was blogging kasi before, the hater keeps on saying that I have bad taste and I’m just complimenting myself (like since it’s open to anonymous, the compliments I got in the account were just from me). And of course, I got hurt, but eventually, I didn’t care less because for me they’re just bullies who want to feel better for themselves by trying to hurt someone’s feelings. I’m ignoring them narin because I’m just being myself and I guess, it bothers them big time and it’s not my problem anymore. LOL Haha for me, just continue being yourself, we can’t do anything about them anyway, they’ll just keep on hating but don’t mind them. Always remember that if we stoop down to their level, we’ll also become like them. Stay classy, never trashy. Lol!!!! Hahahaha and one more thing, if you mind them or you let them bring you down, it’ll make them happy because they’re seeing that what they’re doing is working and you don’t want them to win right? All the best Ate Camille. Thank you April! Glad you are a lucky one! :) The page doesn’t exist anymore, so maybe she got busted? I’ve been exposed to bullying. When I decided to start a blog some time around April this year, I had a lot of hate comments on my posts about my weight saying that “Baboy ka, feeling mo naman blogger ka” (in caps lock btw) and other of the same kind. Obviously, the person or people who commented that went by another name and wasn’t brave enough to show who they were. I was hurt and I actually wanted to stop blogging already but my friends were there to support me and encouraged me to continue doing what I love. But I can’t say that it didn’t affect me because it did. I decided to lose weight and now I have already lost 40lbs! I know that the reason why I wanted to lose weight was not a good reason (since I was like trying to prove myself to them) but now as I continue on my weight loss journey I decided that I’m doing this not for them but for myself. ***** On other note, hi Ate Cams!!! I sent you an e-mail about an invitation to hold a talk for DLSU’s LEAP 2k15. I know a lot of people will try to contact you about this but I really really hope that you’ll accept my invitation hehe!!! Thank you Ate Cams!!!! Hi Camille, you look good even without your bangs. Is that gonna be permanent? You look good though with or without, but without bangs makes you glow more like a mature lady. I love it! Amazing post, I love that you take the time to participate in these kinds of conversations! Oh and I hope it’s fine if I leave a link to a blog post I made two months ago about handling the negativity and frustration brought about by bullying. I hope it helps people who need some inspiration and a motivational push. So here goes –> Food For Thought: Bullying. What Gives? Thanks for always being an inspiration Cams! You rock! super love your look! very refreshing! Oh.. Wow.. Very simple but so elegant..
Whoever she is, thank you! 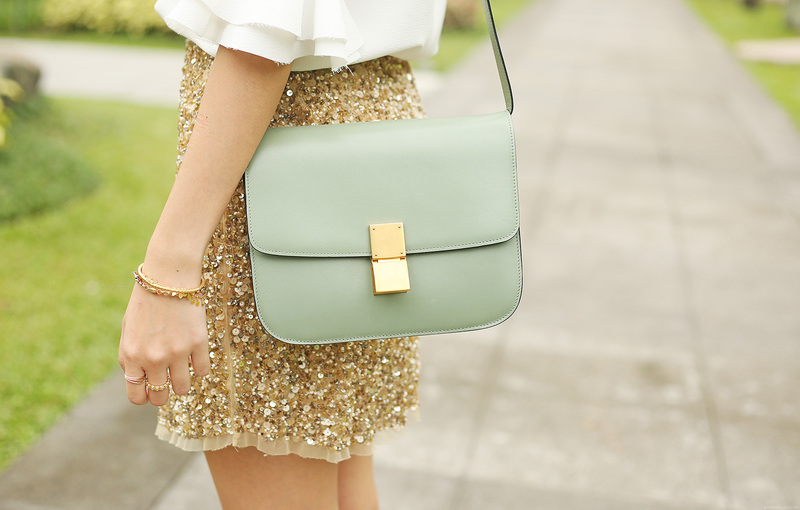 Sequins, especially gold, can be tricky but this skirt is so pretty! As are you.